If you want to get a glimpse of what the summer looked like check out the 2018 Photo Album. In the coming months I hope to get the 2018 Highlight Video posted as well. Lastly, I would like to acknowledge our 2018 Overall Fitness & Distribution Champions. The awards are based on the overall rankings of all 2018 Dynasty summer camp students We carefully compile scores each week from a battery of 11 tests (7 Physical & 4 Distribution) to give our students specific and measurable feedback on how they can improve their game. The winter months in between club and high school seasons are the ideal time to focus on individual development and add goalkeeper specific training into your schedule. This is a time of the year when we typically have more time to address our position specific needs that may not get as much attention during season in the team environment. 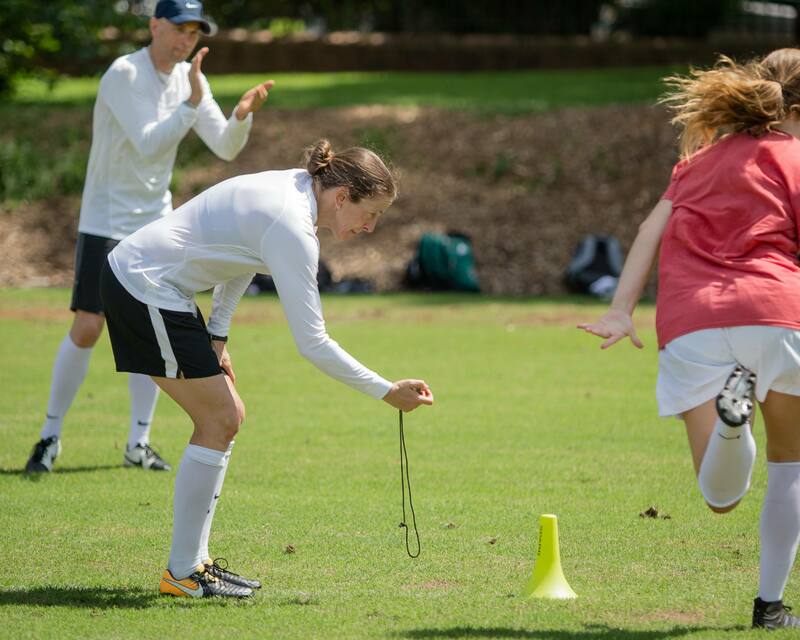 The Carolina Winter Camp in Pittsboro, NC is right around the corner on December 8th & 9th. This camp is open to both male and female goalkeepers ages 12+. Our second winter camp will be held just north of Atlanta at Georgia Gwinnett College on January 19th and 20th, 2019. The ATL Winter Camp is also open to both male and female gks, but will feature split ELITE (ages 13+) and YOUNG GK (ages 10-12) groups. There are still a few spaces left in both camps, so if you are interested in registering please click the appropriate banner below! Both camps consist of two training sessions (4.5 hours total/day) a day (4 total sessions) with a lunch/lecture in between to discuss tactical aspects of the position and cover the essentials of sound nutrition for athletes. If your goalkeeper is competitive, eager to develop, and enjoys working hard, then they will thrive at Dynasty where training is always intense, focused, AND fun! 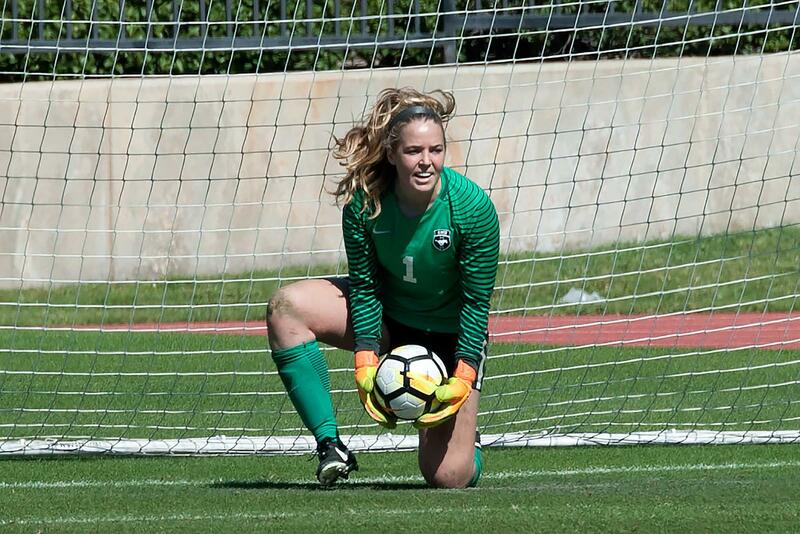 The following article (& photos) featuring Dynasty senior SMU goalkeeper Catie Brown were reprinted from the SMU Athletic website. In the rapid sea of teams racing up and down the field, fans cheer with urgency. Calm and composed, yet alert and ready, she waits in the back of the goal until the strikers close in. Suddenly, the rhythm of her heartbeat keeping time like a drum, senior goalkeeper Catie Brown dives to defend the crisscross-laced net. Predicting opponents’ moves, she knocks away the ball with a whoosh, as her teammates jump up in excitement and relief.For Brown, who is preparing for Sunday’s 7 p.m. home match against Florida International, one of the best feelings is the exultation that accompanies a big save. But, often, there is extreme pressure accompanying the last line of defense. The save that stands out most to the senior happened in 2016 at the conference tournament. Including the epic battle against UCF, Brown recorded 10 saves (including two PK saves) in 290 minutes of play at the tournament, posting an 83.3 save percentage and securing a spot on the 2016 AAC All-Tournament Team. As a sophomore and junior, Brown played and started in every game. Throughout her collegiate career, including the HBU victory on Sept. 2, 2018, she has notched 4,420:25 minutes of competition with the Mustangs. The Sacramento, California, native, even ranks ninth in school history for most shutouts, at 12 for the Red & Blue. 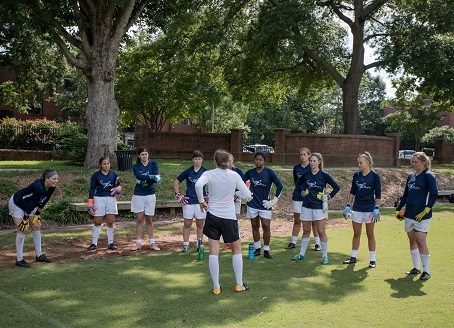 Donning a different color uniform and gloves is one distinction of the position, so during corner kicks or when multiple people are piled under the net, goalies can be distinguished from other players. Traditionally, the goalkeeper gets to wear the number one, as well, which is emblazoned on the front of Brown’s long sleeve jersey. Since the earliest origins of sport, the protectors on the pitch have been integral to the game, that ancient records say began in China during the second and third century B.C. and was famously turned into the football of today by England. But, throughout the years, rules like the back pass rule, which came on the scene during the 1990’s, have changed the role in some ways. One constant, however, is the heart of the unsung hero, hurling through the air to block the path of an impending enemy score. Dedicated to defending the goal, at the beginning of the season, Brown says the team chemistry on the Hilltop is high. “The way the team is meshing really aids in us coming together to learn these new skills and teach the freshmen what we’ve been working on,” Brown said. Freshmen Samantha Estrada and Kierstin Flint make up the rest of the goalkeeper core. “That’s my biggest hope, is just overall team success and keeping that chemistry throughout the season,” Brown said. Embracing a winning mentality, Brown has ambitious expectations for the remainder of the season. A two-time all-conference selection, Jones started in goal in all 16 games for the Panthers, putting in over 1340 minutes between the sticks. She recorded 100 saves, second most in the conference, and finished the year with a .862 save percentage and 1.07 goals-allowed average. Jones also recorded four shutouts, two solo and two combined, and was the SAA Defensive Player of the Week three times this season. Jones earned Second Team honors after being the All-SAA First Team goalkeeper her freshman season. Continues to rack up accolades at South Carolina. Named to the United Soccer Coaches Second Team for a second year in a row and the third time she has earned All-Region honors. Her nine shutouts helped her eclipse both the South Carolina and SEC records for career shutouts at 34. The junior will enter her senior season with the best career goals against average in program history (0.50) and ranks fourth in career saves (165). A two-time SEC first-team honoree, Krzeczowski remained among the elite in net in her junior campaign. She posted shutouts in seven of South Carolina’s 10 league matches. “We have had some outstanding goalkeepers here at South Carolina, and Mikayla has proven to be one of the best,” head coach Shelley Smith said. Strong first season for the Bulls…currently ranks second in The American Athletic Conference in goals-against average (.765). Had three solo shutouts this season, and a .796 save percentage with 39 total saves. Appeared in 15 matches and made 14 starts in net…Was awarded the Horizon League Defensive Player of the Week on 10/8 for her five save, shutout performance against Oakland (10/6). Finished the season with 72 saves, a 1.82 goals against average, a .735 save percentage and three shutouts. Ryan posted a league-high five shutouts against Peach Bowl Conference opponents during the regular season and finished the 2018 campaign with a 0.94 goals against average and 81 saves. She registered four saves on the way to breaking the program record for career shutouts in a 1-0 victory over North Georgia during the regular season and concluded the campaign with a .844 saves percentage. Gina was twice honored as PBC Goalkeeper of the Week as well. Appeared in 18 matches for the Highlanders with 11 starts. Tallied 88 saves with a career best 1.14 goals against average and a .807 save percentage along with nine shutouts for a 11-5-2 program best record. Holds career goalkeeper victories (17) and career goalkeeper shutouts (12). Smith played her undergraduate soccer at both Virginia Tech (2014 & 2015) and the University of Washington (2016) before finishing off her eligibility this fall as a graduate student in Colorado Springs for the Mountain Lions. Smith quickly made an impact and earned Rocky Mountain Athletic Conference Goalkeeper of the Year honors while leading the Mountain Lions to 14 wins this season with 51 saves on the season. A starter in every game for UCCS, Smith posted the fourth best goals against average (0.82) in the conference. Stuteville was granted a fifth year of eligibility prior to the 2018 season, and it paid dividends for the Cardinals. The Kansas City native played all but nine minutes in goal this year. Stuteville recorded 62 saves with a save-percentage of .816. The Saint Louis transfer tallied six solo shutouts and a team shutout for seven on the season. A stalwart in net for the ‘Canes, Tullis-Joyce finished her senior season with a career-high 85 saves, including an ACC-leading 4.72 saves per game. Even more dominant in conference action, the Shoreham, N.Y., native registered 56 saves in 10 matches, including a program record 17 saves at North Carolina on Oct. 21. Ending the season on a high note, the redshirt senior led the Hurricanes to a 1-0 victory over ninth-ranked Florida State, registering seven saves to earn her second-career ACC Defensive Player of the Week distinction. Against the Seminoles, Tullis-Joyce arguably made the biggest save of the season with only 10 seconds remaining in regulation of a scoreless match. Off of a cross, FSU’s Dallas Dorosy found herself in front of the net sending a header towards the bottom right corner. However, the quick reactions of Tullis-Joyce allowed her to get a hand on the ball and send the match into overtime. Overall, the Shoreham, N.Y., native closed out her illustrious career with 62 starts and ranks in the top-three all-time in numerous categories, with 24 wins (third), 14 shutouts (tied for second), 259 saves (third) and 5,584 minutes in net (second). It has been a BUSY and impressive year for Angelina. Anderson was named a back-up to the U20 Women’s World Cup Team which took place in France in August and she is currently in Uruguay competing as the starting goalkeeper at the U17 Women’s World Cup. The U17’s won their opener 3-0 versus Cameroon, but unfortunately dropped the second game to defending champions North Korea 0-3, and their final group stage game to Germany 0-4. It was a hard and disappointing finish for the players and staff that had invested so much of their last two years in preparation. Despite the result, in time, I am sure that Angelina will agree that it was still a valuable and cool experience nonetheless! 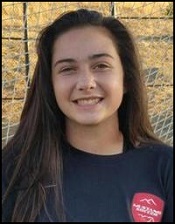 Congratulations to Leah on getting called back in to another camp with the U.S. U16 Girl’s National Team. Congratulations to Phallon, a RS senior at the University of Miami, who received her first call up to a U23 U.S. Women’s National Team camp. EXCITING! After redshirting her freshman season at Miami she has been a steady force from the back and four year starter for the Hurricanes.